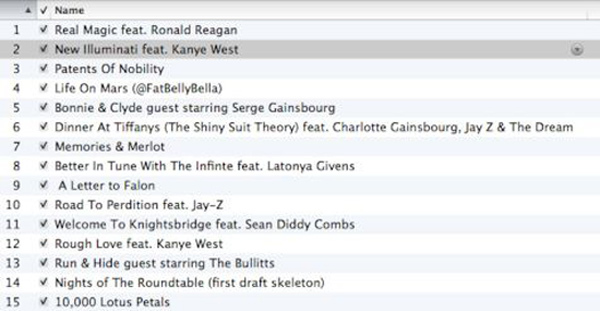 Is This The Tracklisting To Jay Electronica’s Album Act 2: Patents of Nobility? I can’t even believe my eyes: is this picture going to disappear once I hit “publish”? Jay Electronica took to his Twitter page to unveil the tracklisting for his long-awaited album Act 2: The Patents of Nobility. I feel like this album was supposed to come out damn near two years ago… wait, that’s because it was. Didn’t Jay ElekYarmulke announce that his album was done in March? I even remember when Young Guru gave praise for Act 2, and he was so floored that it left him speechless. Many of you may feel as though my tone is overly aggressive and slightly bitter: that’s because it is. I’ve been preaching about this man from the first time I heard him, and that was five years ago. He is a very mysterious person, and his lyrics are deep and powerful; Jay is the type of emcee that the game needs, and I’ve been saying that Act 2 could change the game for a long time. I haven’t completely lost all of my faith, but as more time passes, it really gets harder for me to care. I’m a marketing major, and I understand that you need to drive up demand for your product, but when you give people empty promises and broken dreams, you’re only hurting yourself. I still remember the first time I discovered Jay Electronica’s music: I was browsing files on SoulSeek, and I found a random file folder that had the name Style Wars EP. I figured I would give the dude’s music a chance; hell, he even had some J Dilla beats. From the first stanza of “Renaissance Man”, I was an instant fan: Style Wars was like nothing I had ever heard; it sounded like the future of Hip-Hop. When was the last time an emcee decided to rhyme over a movie score? The answer: never. Even though I might be a little bit caustic in my convictions, I still have hope. I have hope that Act 2: The Patents of Nobility will see the light of day, and I hope that it hits me the same way the Style Wars EP did five long years ago. We all know that some things are better late than never, and I have the feeling Act II will be a perfect paradigm in proving the validity of this notion. Editor’s Note: Where in the hell is “Dear Moleskine” on this tracklisting? This entry was posted on Tuesday, July 31, 2012 at 10:18 pm and is filed under Album Update, News with tags Act 2: Patents of Nobility, Jay Electronica, Roc Nation, Style Wars EP, Young Guru. You can follow any responses to this entry through the RSS 2.0 feed. You can leave a response, or trackback from your own site.